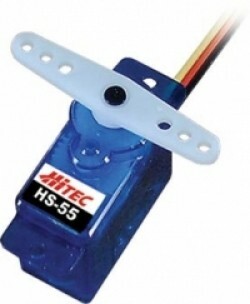 Hitec's HS-45HB offers the economy and durability of our other famous micro servos, but now with a ball bearing supported output shaft and Karbonite gears. 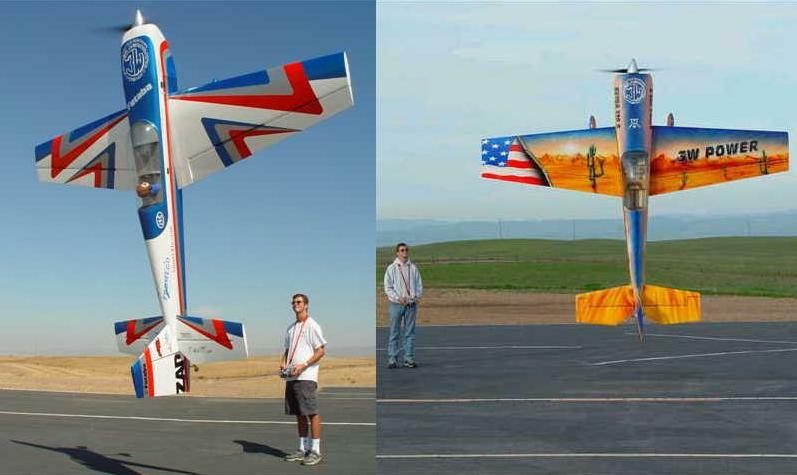 The perfect choice for any micro application from indoor R/C and hand launch gliders, to ultra small electric Park and Yard fliers, but it can handle the duties of larger electric 3D aerobatic aircraft as well. 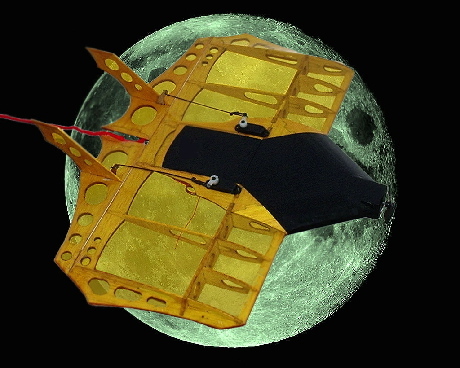 Mount it upright or flat; either mounting style is accepted with its unique case design. Note: Case color may vary. Universal connector. Choose Quantity Option below. Want 1, 2, or 3 servos? Select first option, then enter quantity 1, 2, or 3. Want a bulk discount? 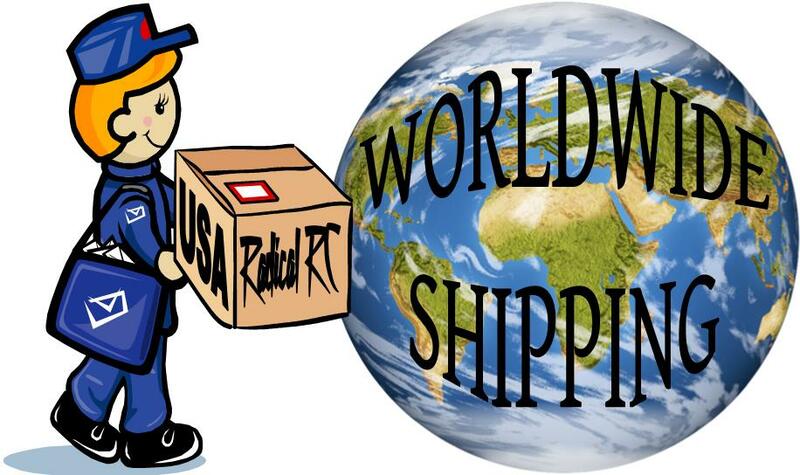 Select bulk quantity, then enter quantity of 1. 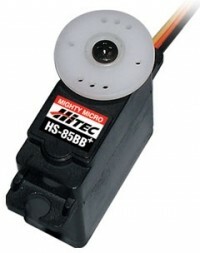 The Hitec HS-50 Feather Micro servo is a modern miracle of miniaturization. Featuring precision components that have been engineered to provide long lasting trouble free service. The HS-50 is the perfect choice for any micro application from indoor R/C and hand launch gliders, to ultra small electric Park and Yard flyers, Speed 400 and 1/2A powered aircraft. Universal connector. The Hitec HS-53 continues the Hitec tradition of affordable performance. Featuring precision components that have been engineered to provide long lasting trouble free service. The HS-53 is the perfect choice for any micro application from indoor R/C and hand launch gliders, to ultra small electric Park and Yard flyers, Speed 400 and 1/2A powered aircraft. Universal Connector. 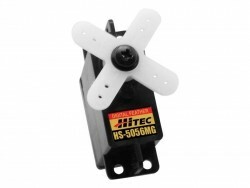 The Hitec HS-55 continues the Hitec tradition of affordable performance. Featuring precision components that have been engineered to provide long lasting trouble free service. The HS-55 is the perfect choice for any micro application from indoor R/C and hand launch gliders, to ultra small electric Park and Yard flyers, Speed 400 and 1/2A powered aircraft. Universal Connector. 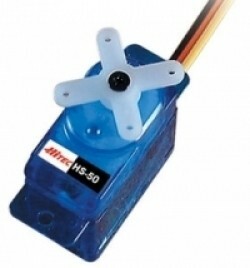 Considered one of the most powerful servos in the micro class, the HS-65 is offered with a choice of "shock resistant" Metal or "zero wear" Karbonite gears. 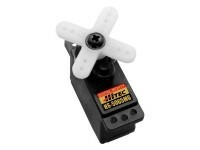 The 65 series features a top-ball bearing for long life and positive centering, 31 ounces/inches of power at 6 volts and is an excellent choice for higher performance micro helicopters, electric park flyers, and 1/18 scale cars. 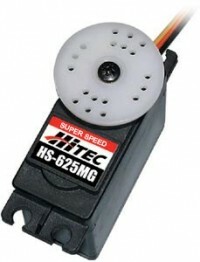 Considered one of the most powerful servos in the micro class, the HS-65 is offered with a choice of "shock resistant" Metal or "zero wear" Karbonite gears. 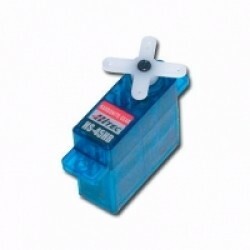 The 65 series features a top-ball bearing for long life and positive centering, 31 ounces/inches of power at 6 volts and is an excellent choice for higher performance micro helicopters, electric park flyers, and 1/18 scale cars. Universal connector. 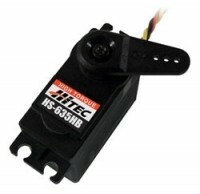 The HS-81 and HS-81MG are among Hitec's most popular servos. Available in both resin and metal gear versions. With a fine balance between speed and torque, the HS-81's were designed to be both economical and reliable. Universal Connector. Factory back order, they've informed us that they expect them to be available late this month. 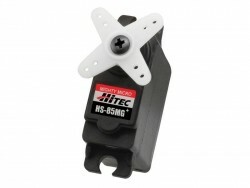 The HS-82 (HS-81 with metal gears) among Hitec's most popular servos. Available in both resin and metal gear versions. With a fine balance between speed and torque, the HS-81's were designed to be both economical and reliable. 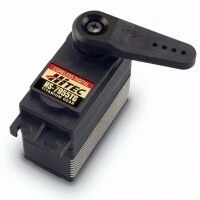 The HS-85BB features a high power motor for greater speed and torque. 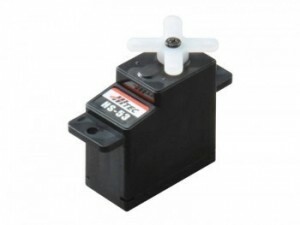 Available in both resin and metal gear versions, the HS-85BB is the choice of modelers looking for a high performance servo without breaking the bank. 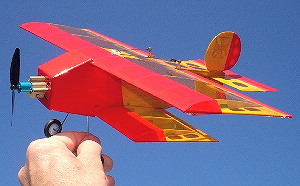 The ball bearing supported output shaft and sturdy gear trains are great for unlimited sailplane flaps and ailerons. Universal connector. 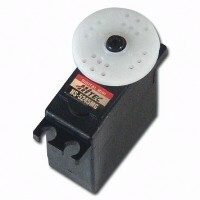 The analog HS-125MG is truly a super thin servo measuring 1.2" x 0.4" x 1.3". Featuring Hitec's MP Gear, the HS-125MG is very durable, and a perfect fit in the slim wings of today's high performance gliders. The analog HS-225 series represents a good value with performance that rivals other larger and more expensive servos. 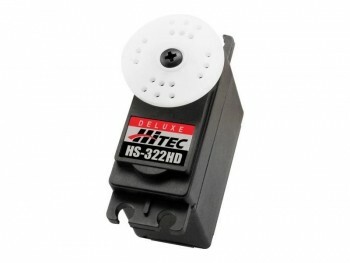 Ideal for applications that call for a small, lightweight, high speed, high torque servo, the HS-225BB and HS-225MG high performance mini servo's feature a top ball bearing and is built with state-of-the-art SMT technology. Universal connector. The HS-322HD Standard Heavy Duty Servo utilizes Hitec's revolutionary Karbonite gear train which is four times stronger than our standard white nylon gears, and even after hundreds of thousands of cycles they don't show any signs of wear. 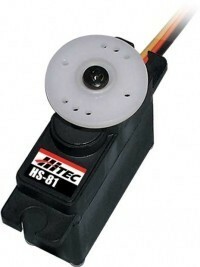 Karbonite gears and our custom IC make the HS-322HD a great choice for an economical sport servo. The HS-425BB is offered with dual ball bearings, impact resin gears and high performance circuitry. As one of our longest running production servos, it has proven to be a durable and dependable product year after year. 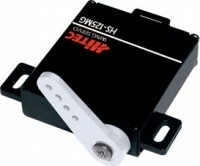 The HS-485HB updates the very popular HS-475HB by adding more torque and greater speed. With its top ball bearing, heavy duty, high impact Karbonite gears and high performance circuitry, the HS-485HB offers lots of torque and features excellent centering and resolution. The powerful high speed HS-625MG is a perfect choice for those applications requiring a fast and strong standard size servo. Utilizing our M/P and metal gear train technology, the HS-625MG is a fantastic sport servo for larger planes and 10th scale sport vehicles. The HS-635HB utilizes the revolutionary "Karbonite" gear train. Karbonite is four times stronger than our standard nylon gears and even after hundreds of thousands of cycles it does not show any signs of wear. With a powerful motor and dual ball bearing mounted output shaft, the HS-635HB offers plenty of torque and speed. If your application requires increased speed and torque, the HS-635HB is the perfect upgrade from a standard size servo. 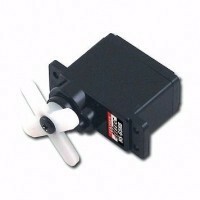 Applications: Heli's and Aircraft up to 72" or up to 12lbs when using just one servo per control surface. 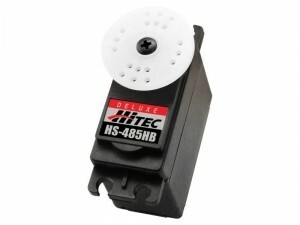 Hitec raised the bar by offering the ever popular HS-65 in a new digital version! 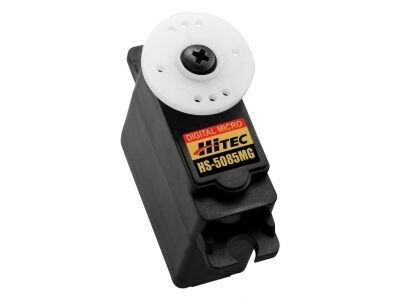 The HS-5065MG High Performance Micro Servo features Hitec's digital, programmable circuit for incredible resolution, centering and holding torque. Featuring metal gears, a top-ball bearing, and at 31 oz./in. 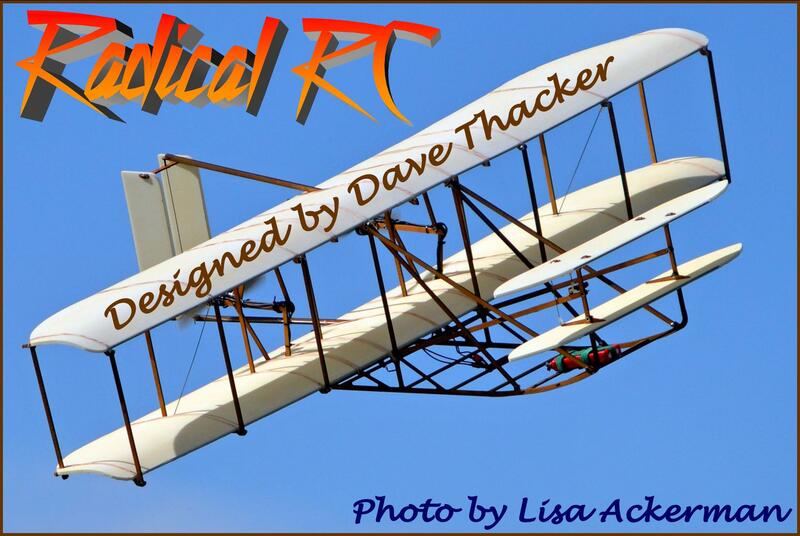 of torque with a quick transit time of 0.11 sec at 6 volts, it is no doubt THE choice for high performance micro helicopters, electric park flyers, and 1/18 scale cars. 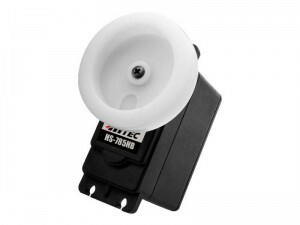 The HS-5085MG Premium Digital Feather Servo is the perfect choice for larger indoor R/C, hand launch gliders, small electric Park flyers, and can handle the duties of smaller electric 3D aerobatic aircraft as well. 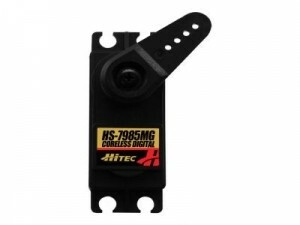 Combined with a programmable digital amplifier, metal gears, and precision components that have been engineered to provide long lasting trouble free service, the HS-5085MG sets the standard for Digital, heavy duty, ultra micro servos. 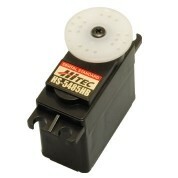 The HS-5245MG is latest addition to Hitec's ever evolving digital servo line. With a custom designed programmable digital circuit and our unique Alumite gear train technology the the HS-5245MG is ideal for applications that call for a small lightweight, high speed, high torque servo. The HS-5485HB is Hitec's lowest price digital servo and is an excellent choice for sport airplanes up to .60 size. Featuring a programmable digital circuit and our Karbonite gear technology that offers four times the strength as our standard nylon gears and after hundreds of thousands of cycles won't show any signs of wear. The new HS-7985MG High Torque Digital Servo has the added benefit of our new G2 second generation programmable digital circuit. This circuit has twice the resolution of our original circuit while adding programmable overload protection. The technology doesn't stop at the circuit board, with a high performance coreless motor, dual ball bearing supported output shaft, bushing supported gear shafts and our Heavy Duty Metal gear train the HS-7985MG was designed to withstand the stress of larger high performance aircraft and on/off road vehicles. Programmable Features Include: Dead Band Width, Direction of Rotation, Speed of Rotation (slower), End Points, Neutral Points, Fail Safe On/Off, Fail Safe Point, Resolution* (default is high resolution) and Overload Protection* (default is off).